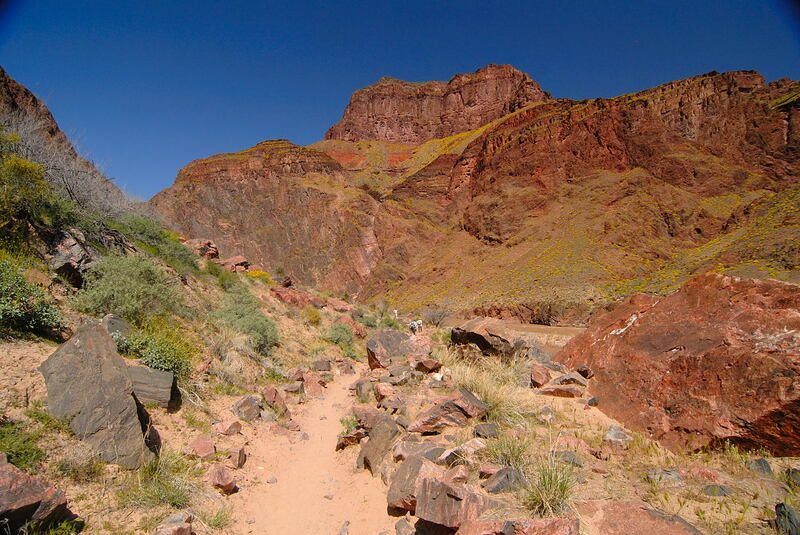 The map at the left shows the detailed view of the third part of the virtual hike. The pictures are numbered to indicate the approximate locations where they were taken. 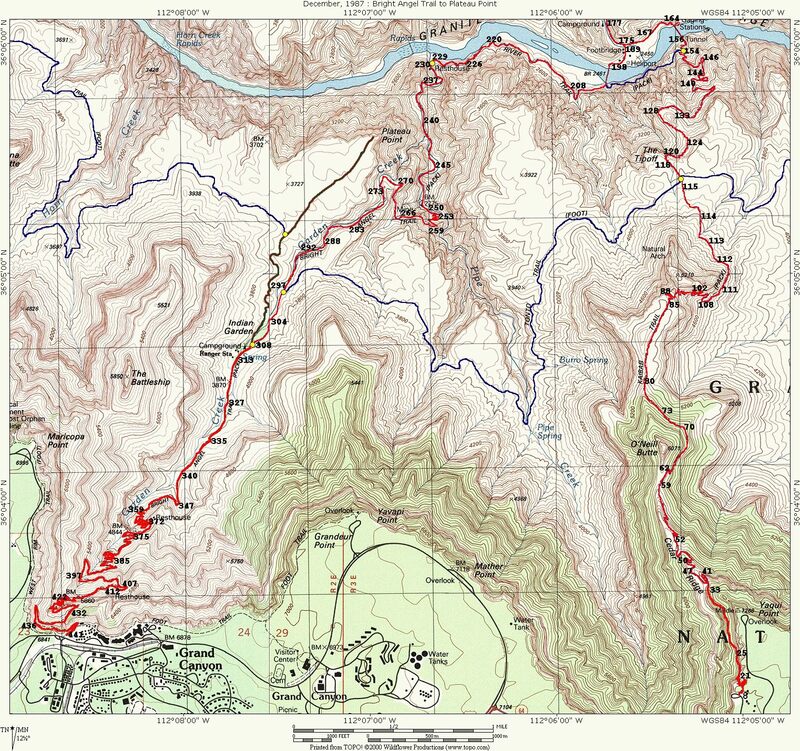 Click here if you want to see the entire map (957k) showing the entire route with the pictures marked. 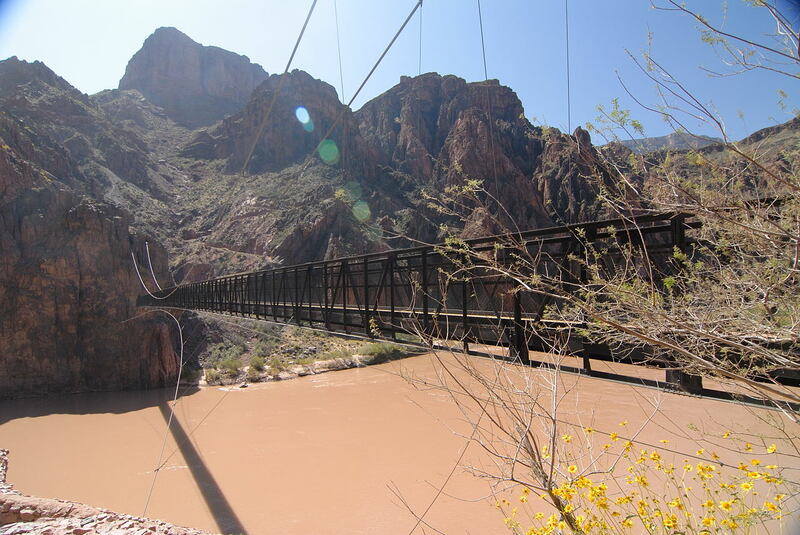 Arrival onto Black Bridge (a.k.a. 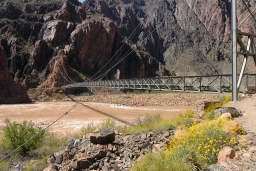 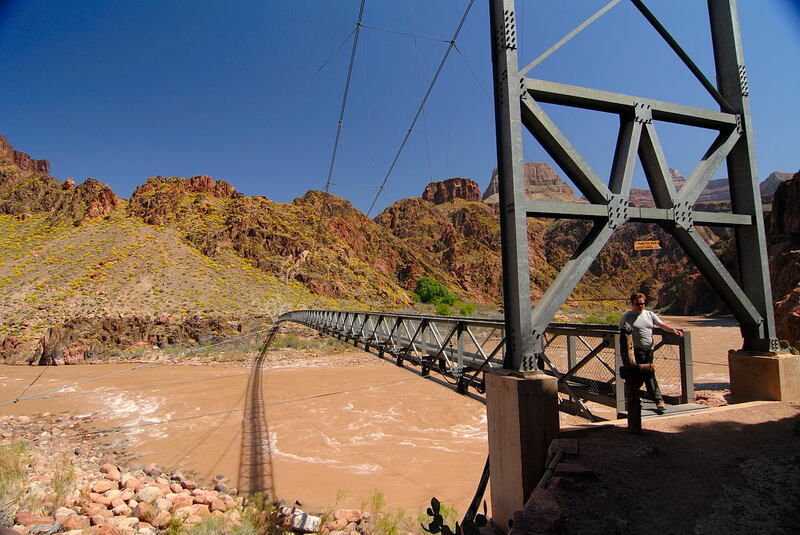 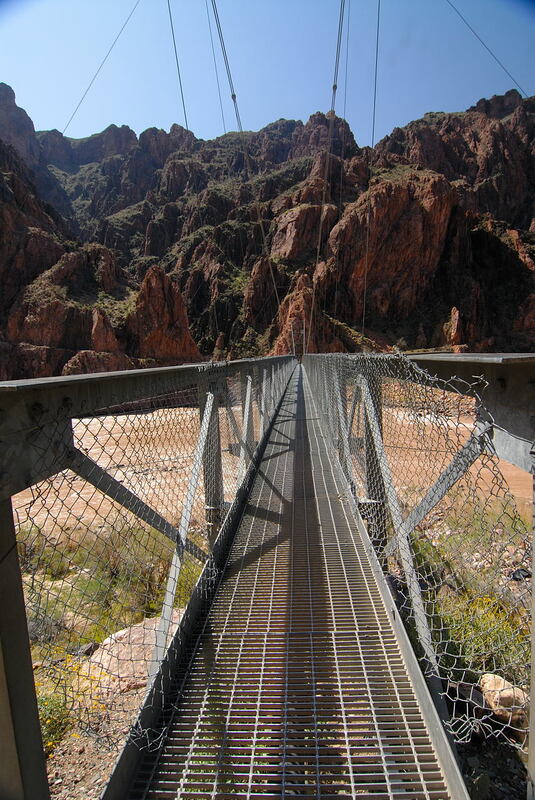 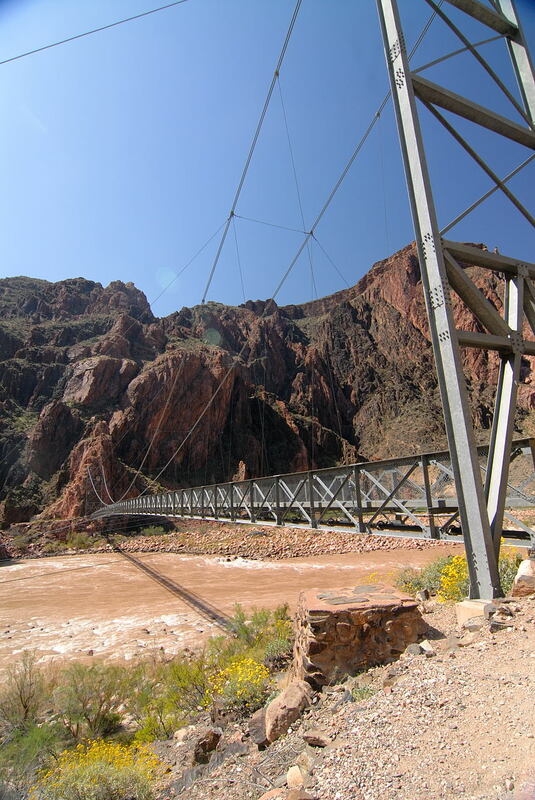 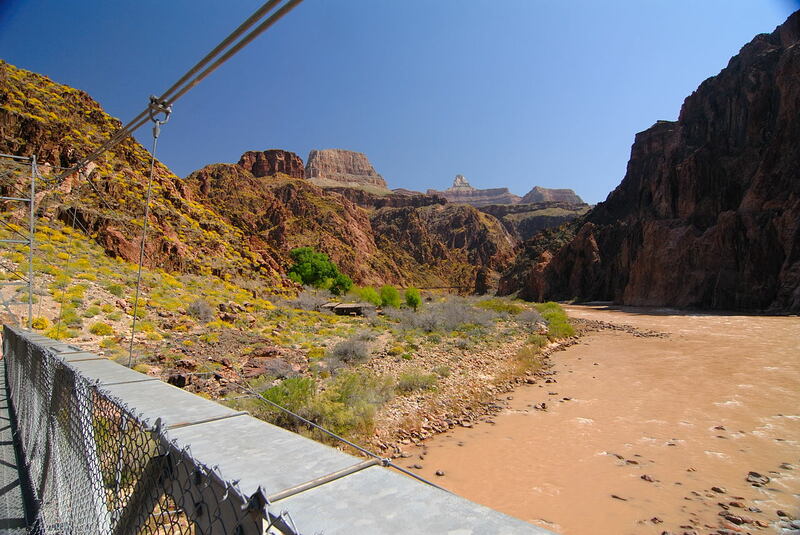 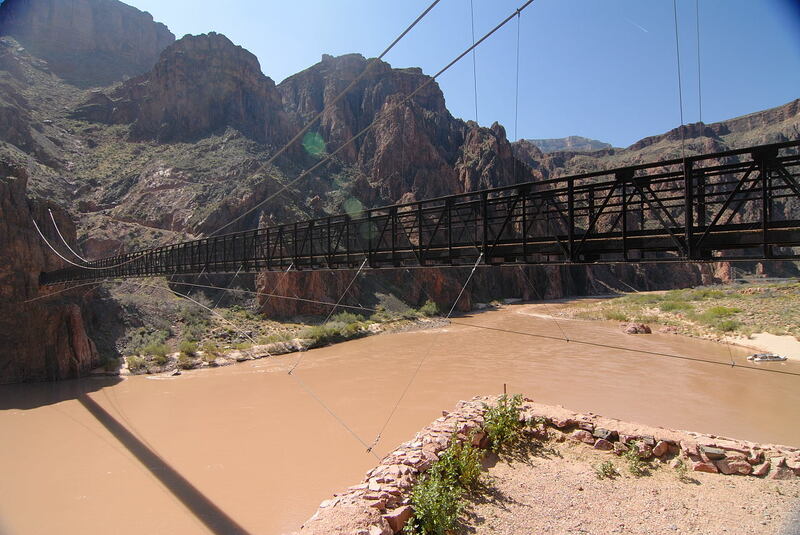 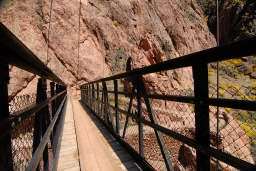 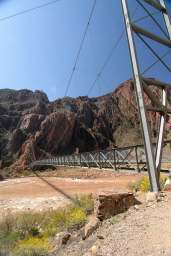 South Kaibab Suspension Bridge) is always something special. 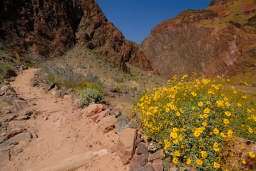 It is the end of the grand descent. 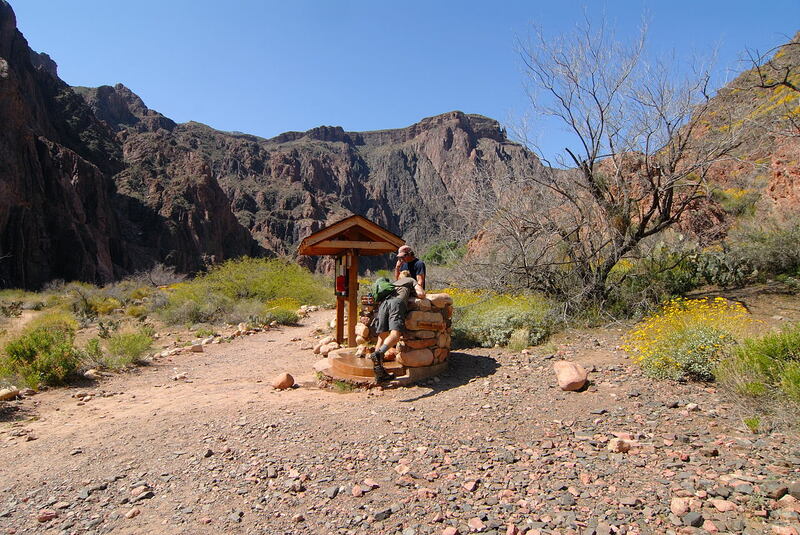 For 3 different hikes this has been my turnaround point and headed right back up the South Kaibab. 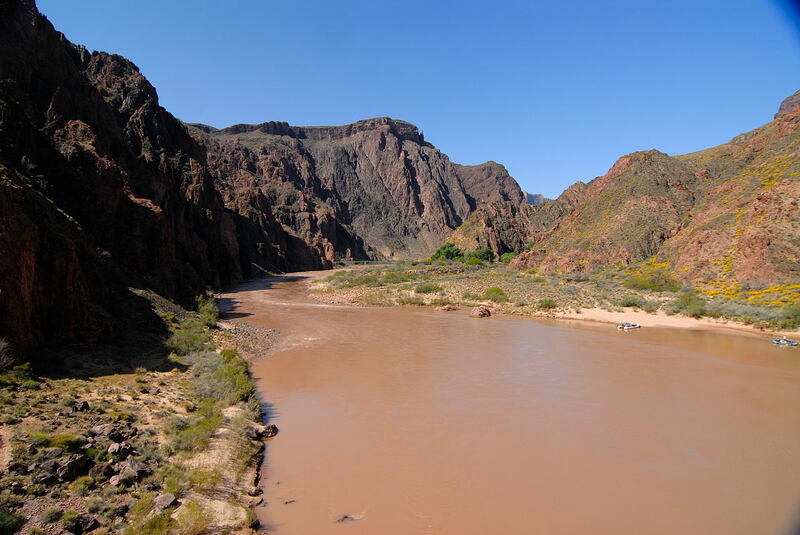 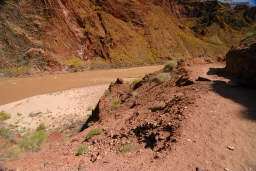 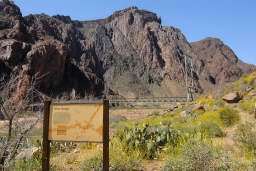 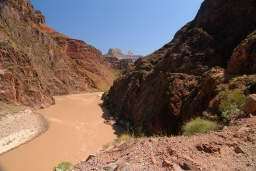 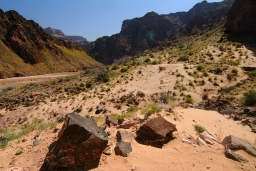 This not only violates the rule of never do a day hike to the river and back, but also the more serious one: don't go up the South Kaibab! If you're not in a hurry, take the small diversion down to Boat Beach. 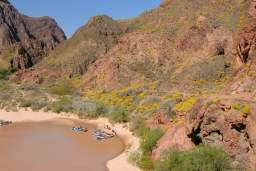 Just as the name implies, there's sand and there are generally boats. 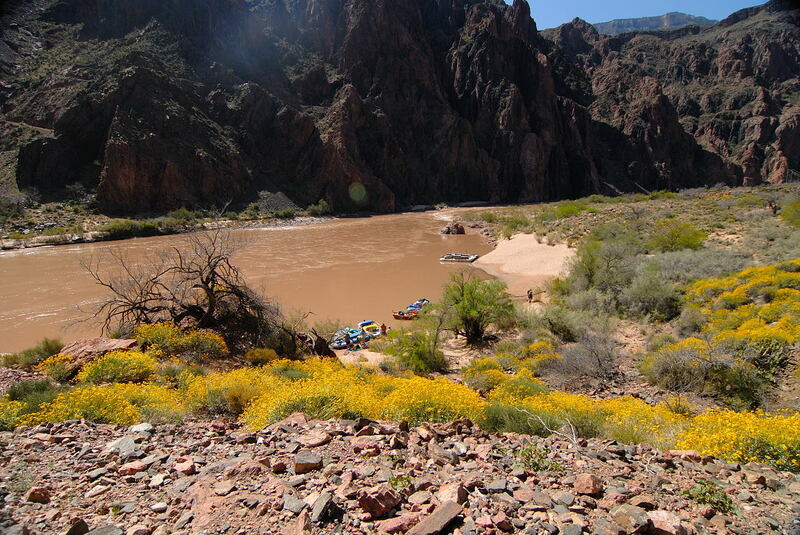 Well, not exactly boats, but rafts as this is a regular stop for the rafting trips down the Colorado. Your first chance for water is less than a quarter mile from Black Bridge from the well seen in the pictures above..
Now that you're at the bottom, the atmosphere is very different in three ways. First, there is the noise of the rushing river which seems to fill the gorge. 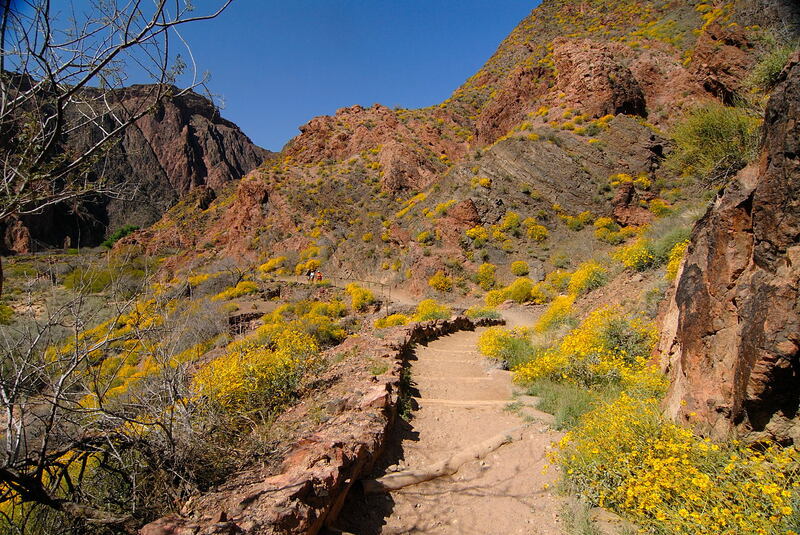 Second, you can really feel the warmer temperatures. 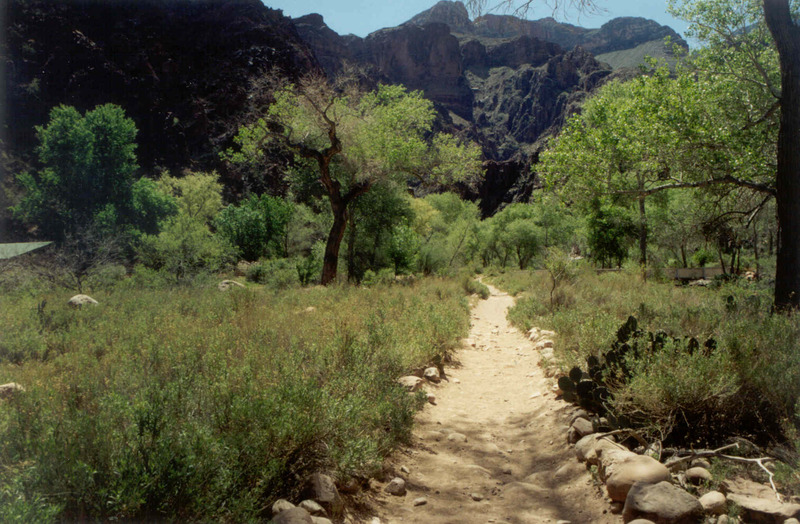 And third, there is considerable vegetation on the trail. 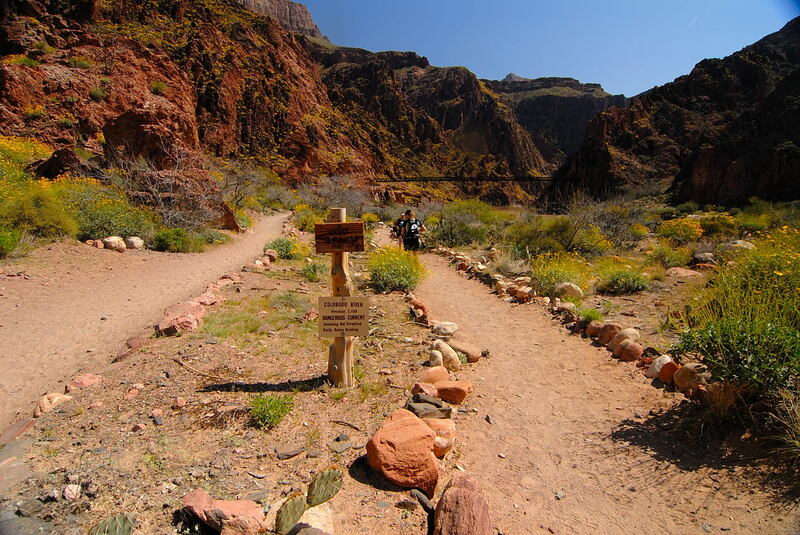 We are now at the official end of the South Kaibab Trail. 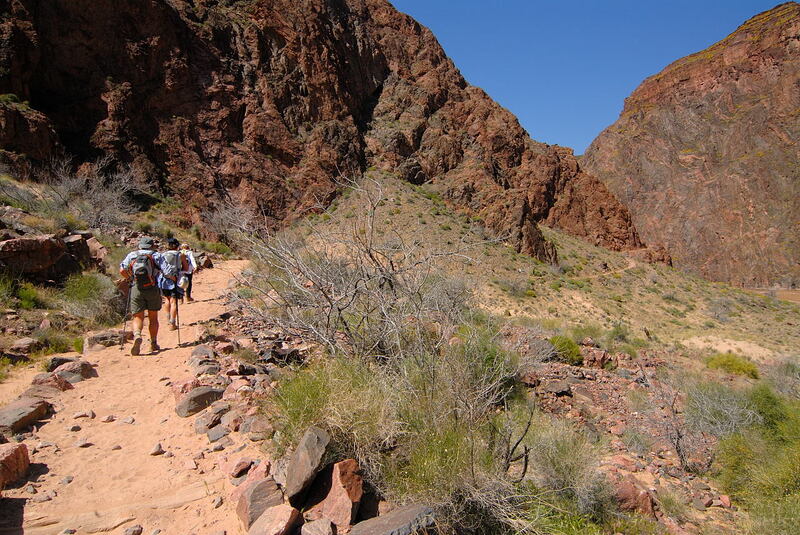 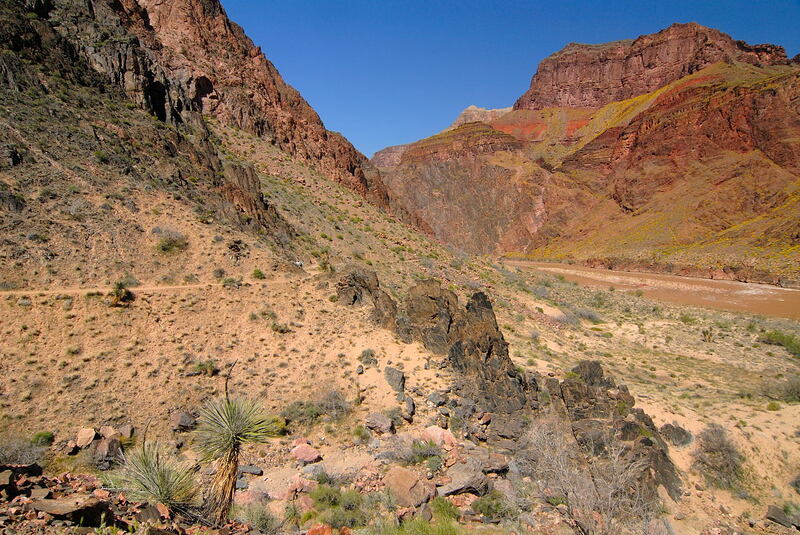 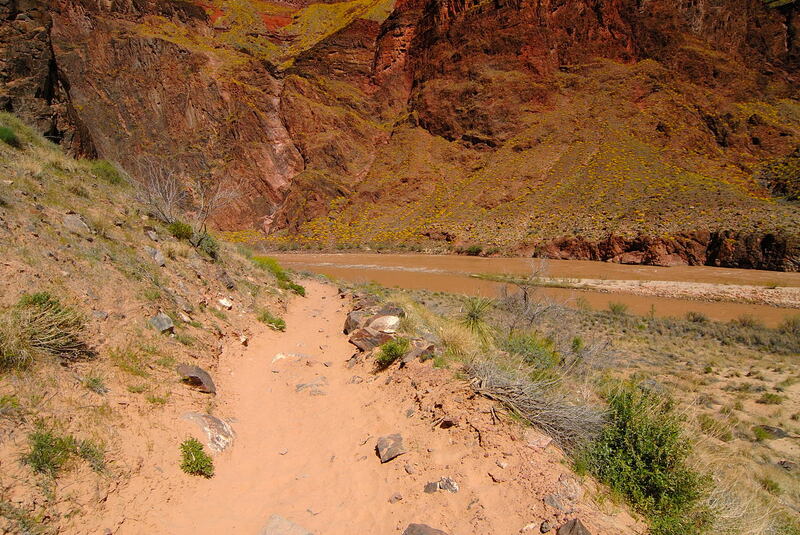 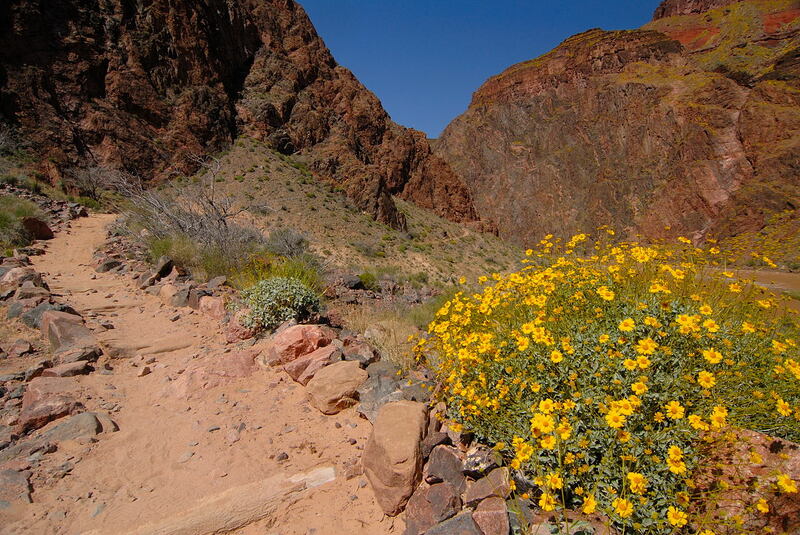 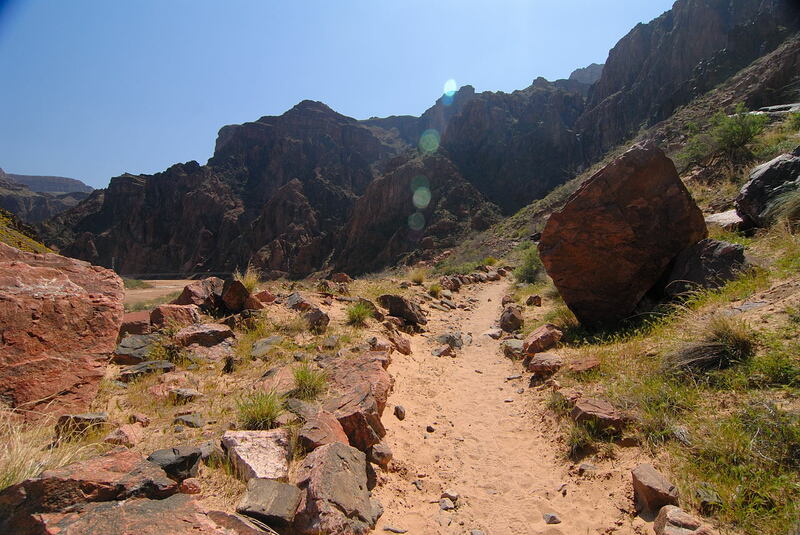 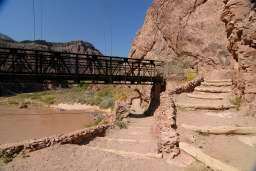 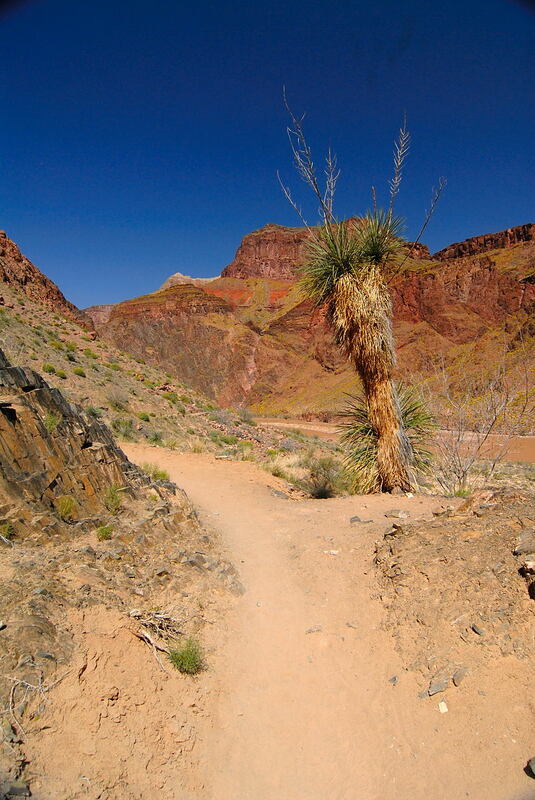 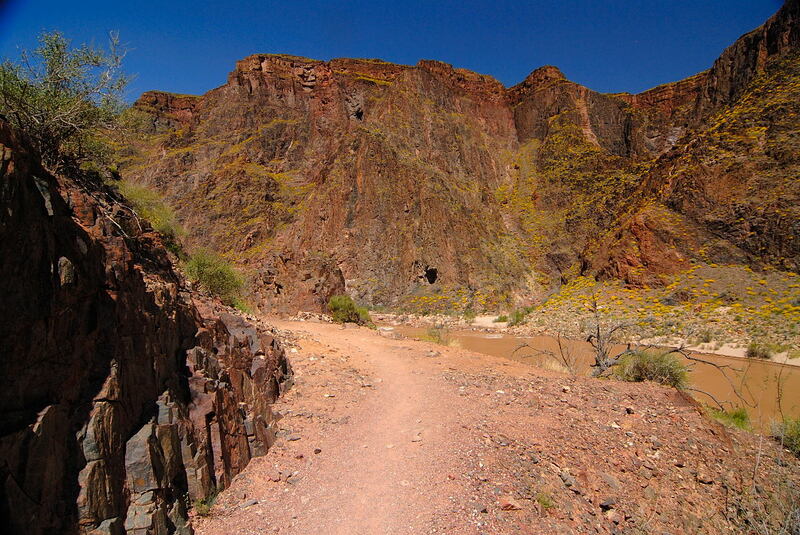 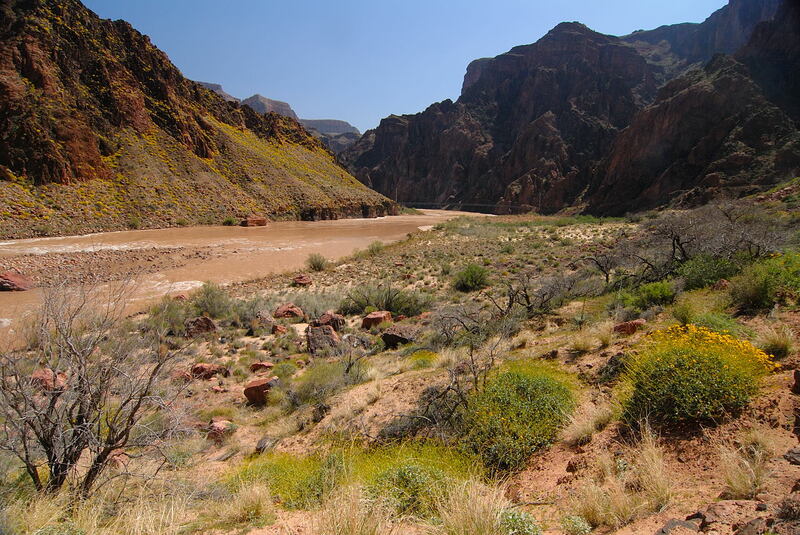 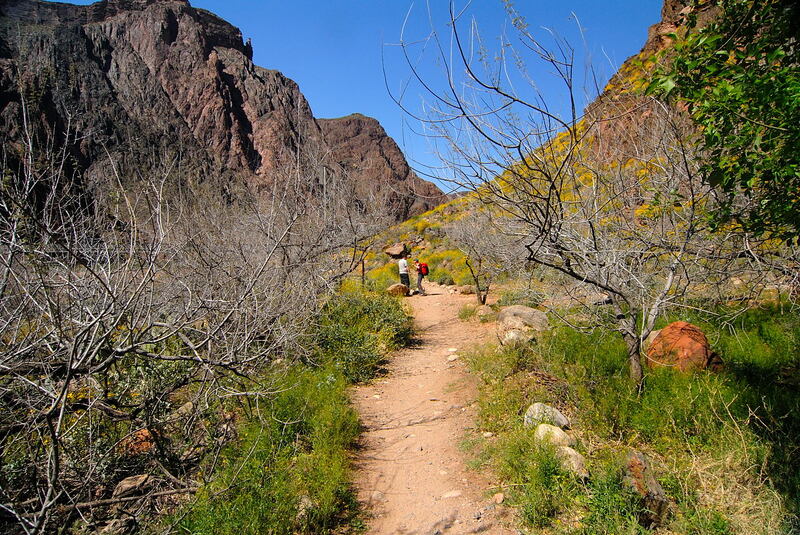 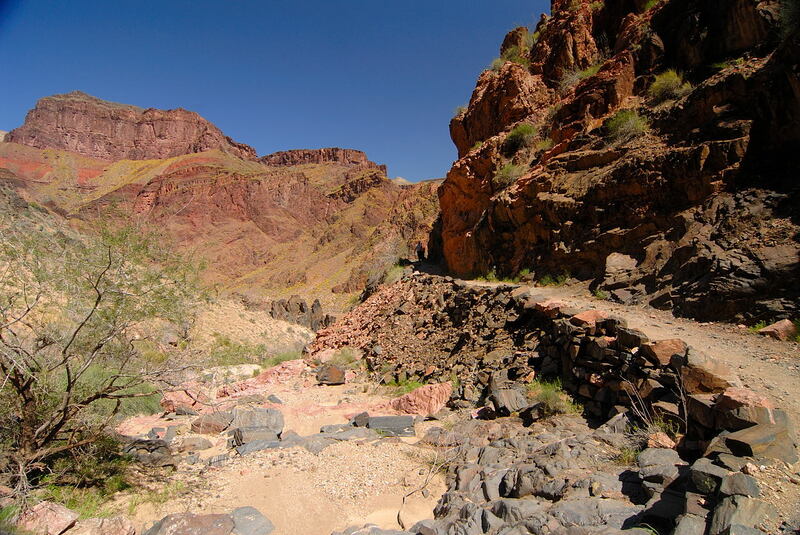 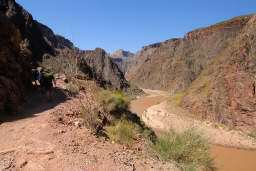 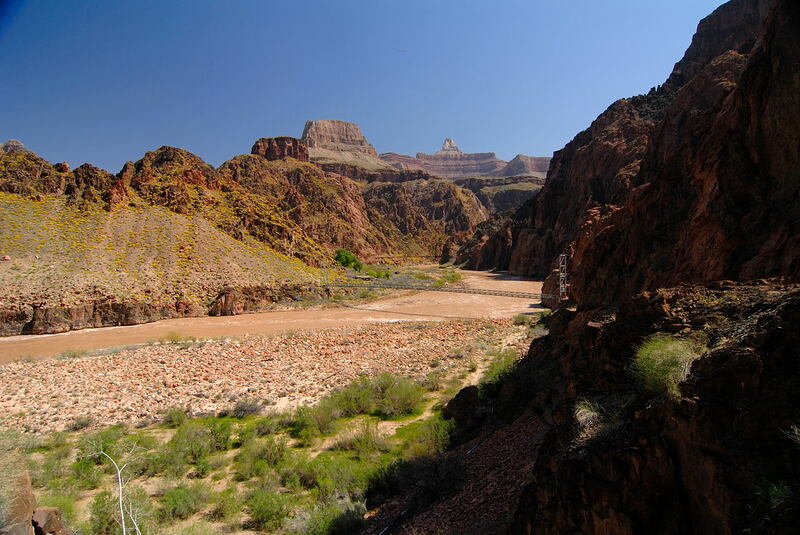 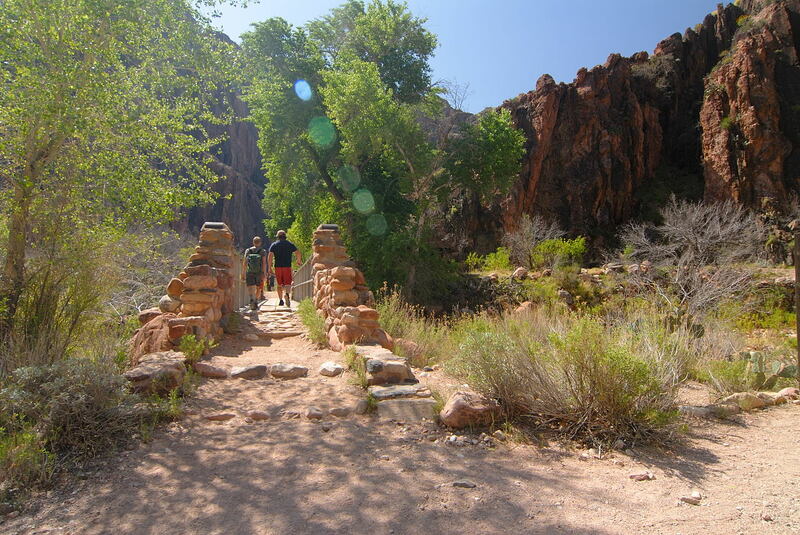 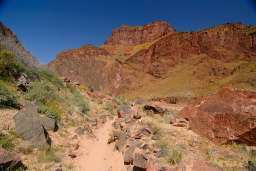 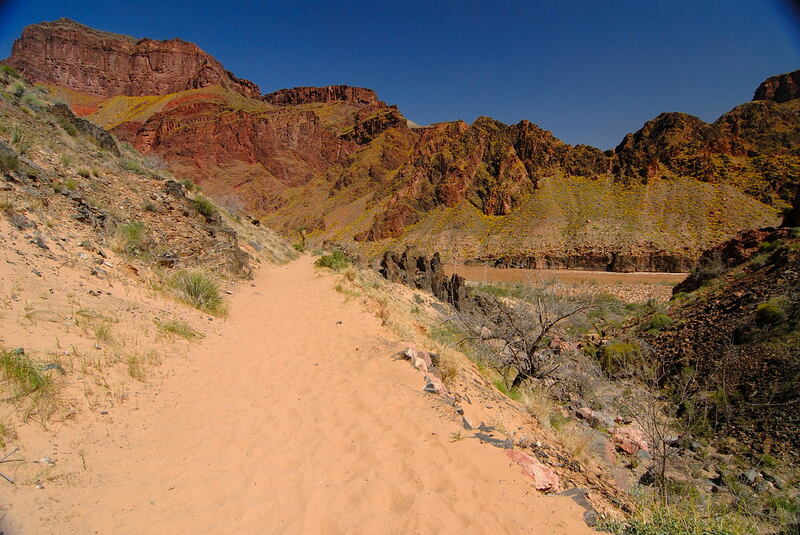 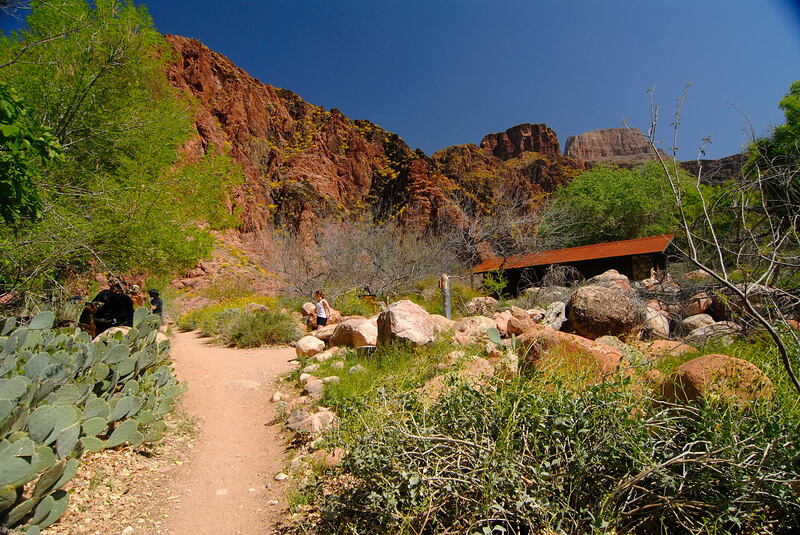 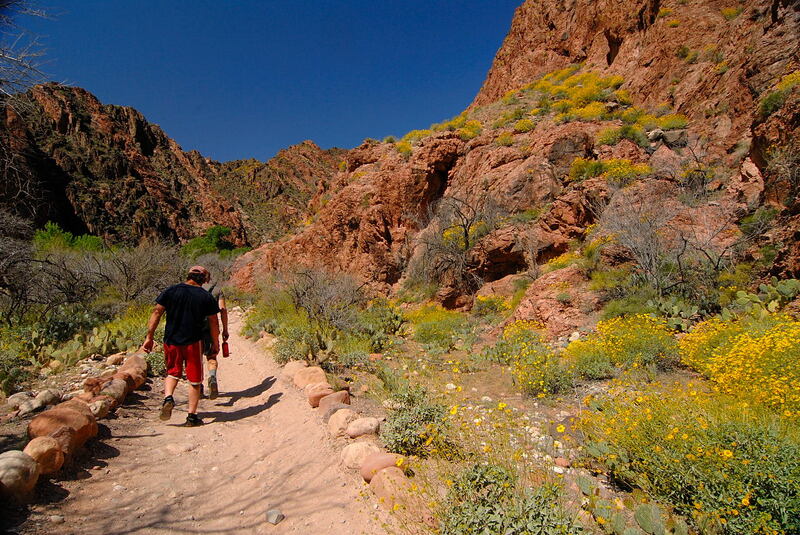 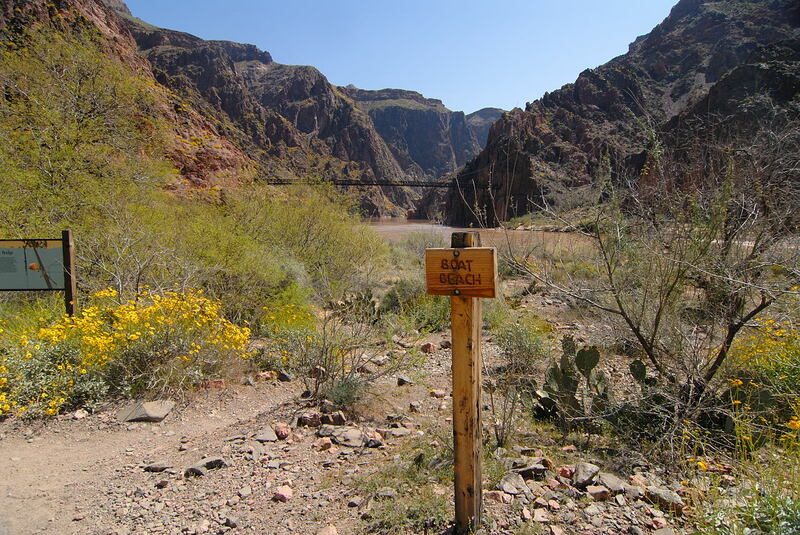 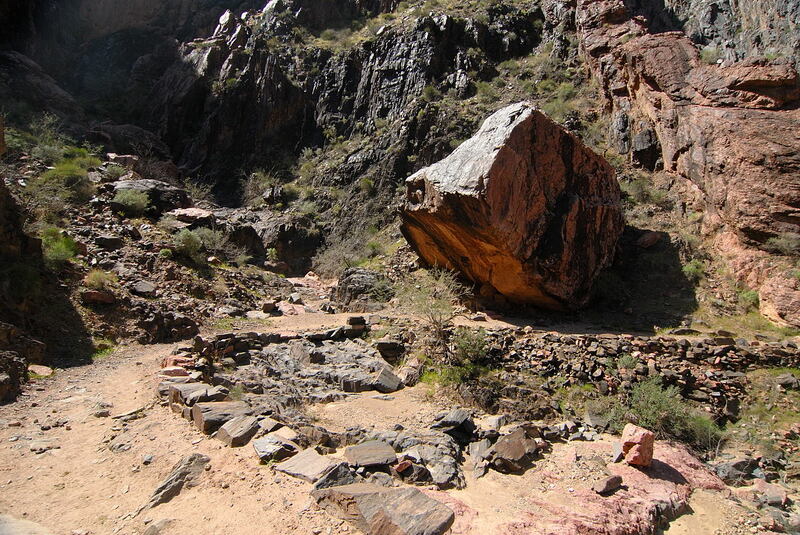 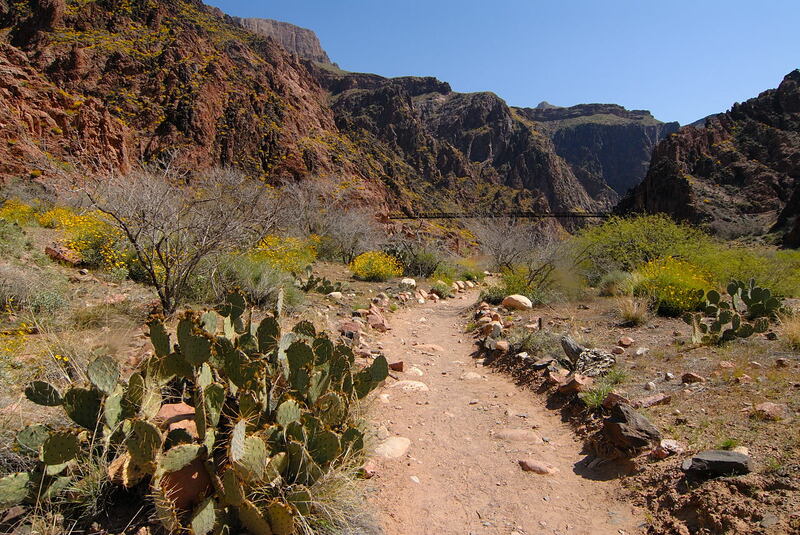 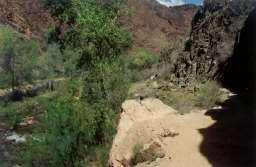 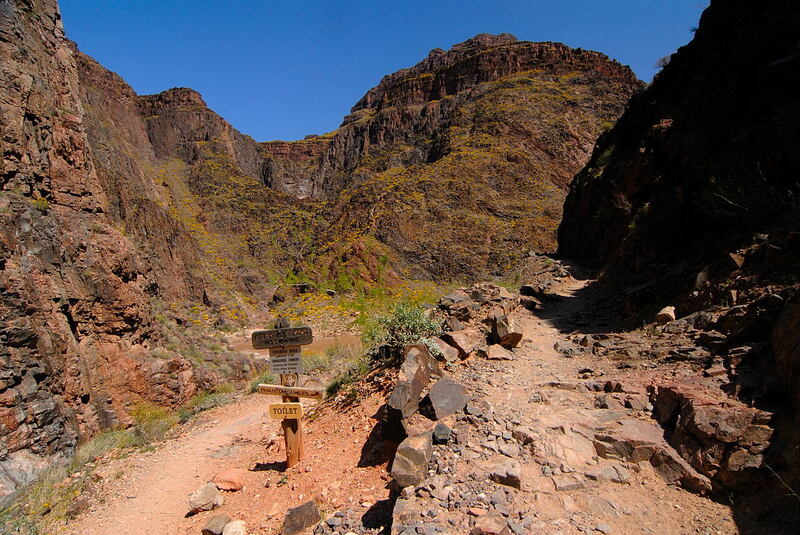 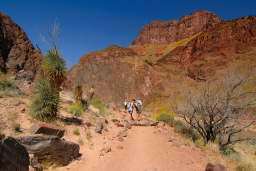 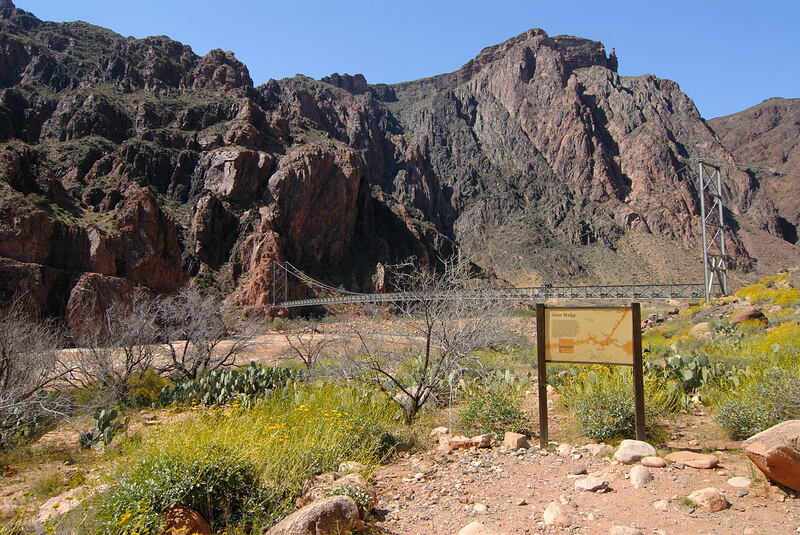 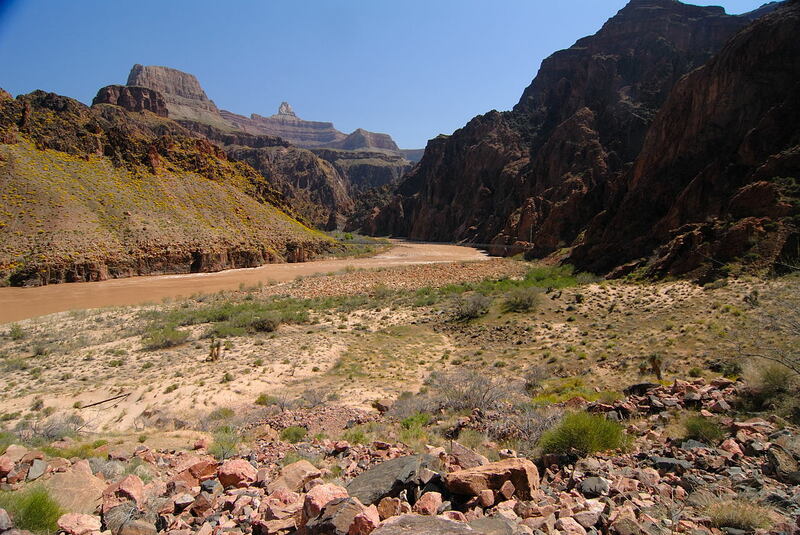 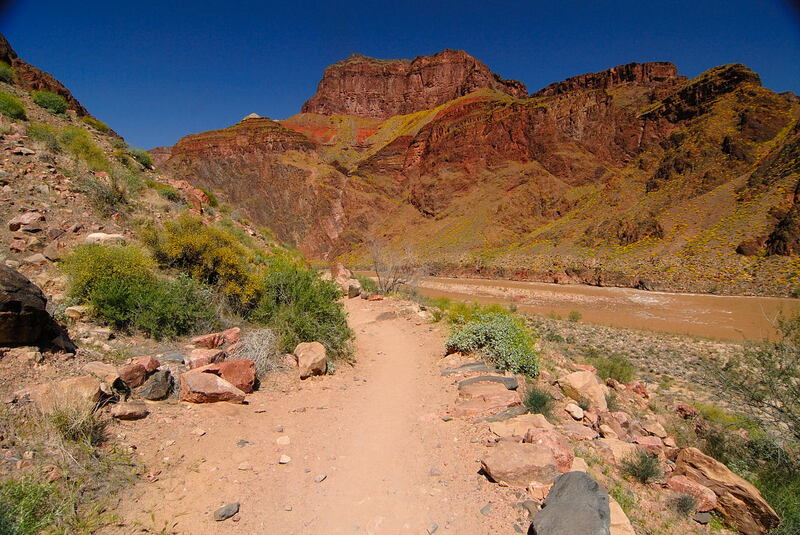 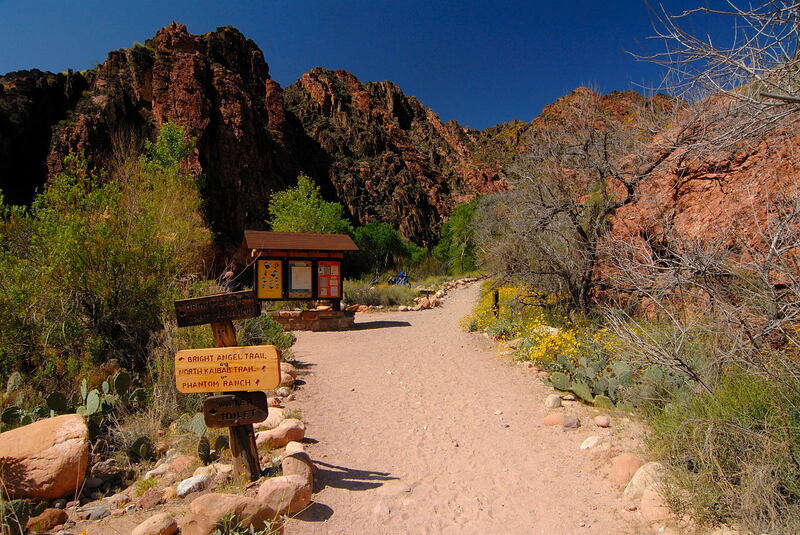 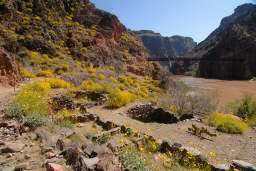 The path to the left will get you water, toilets, and the River Trail and onto the Bright Angel Trail. 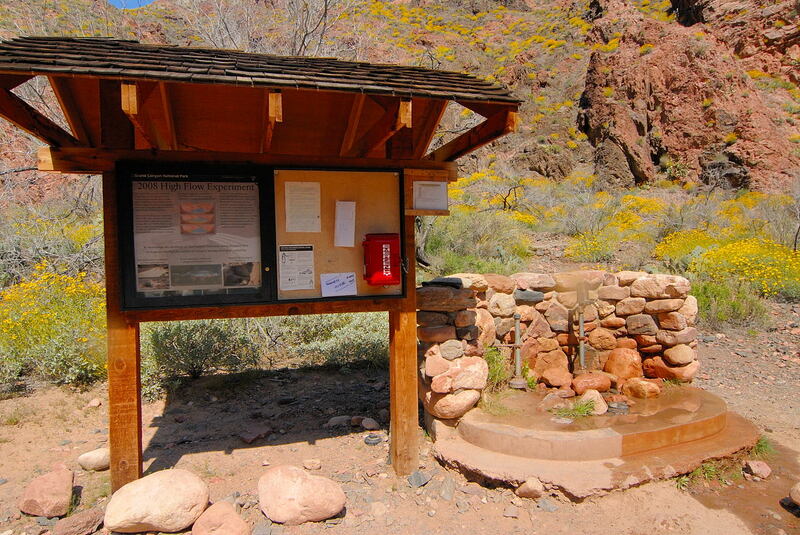 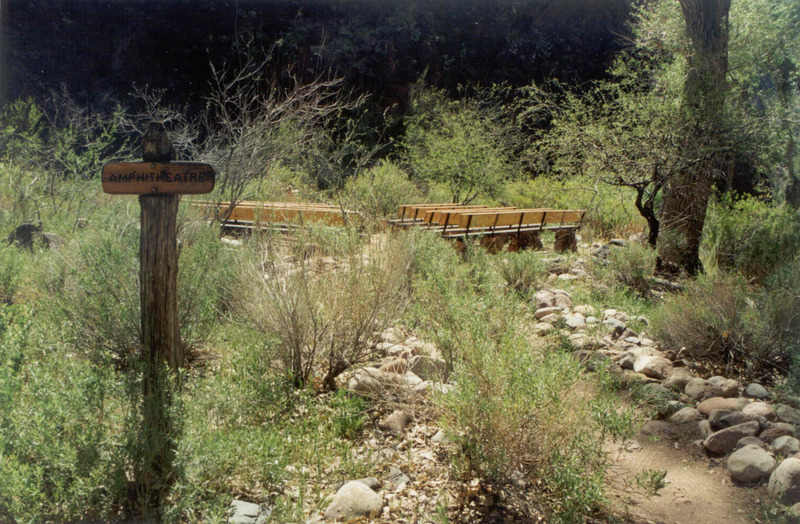 At the information sign we take the path to the right (technically the North Kaibab) which takes us along the beautiful Bright Angel Creek and it's beautifully clear running water. 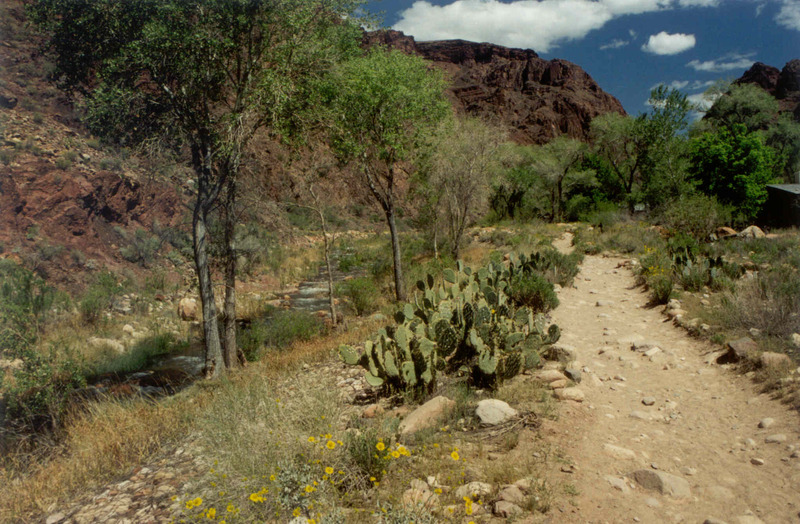 On the other side of this creek is the Bright Angel Campground. This will take us to Phantom Ranch. 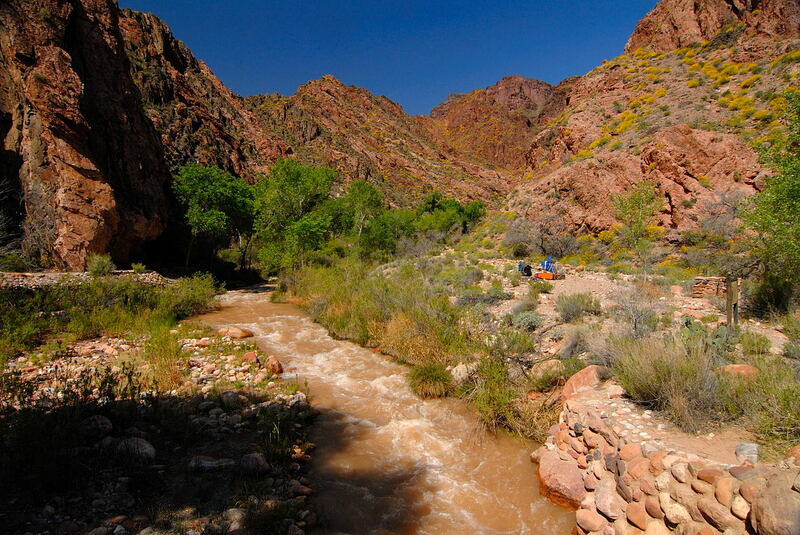 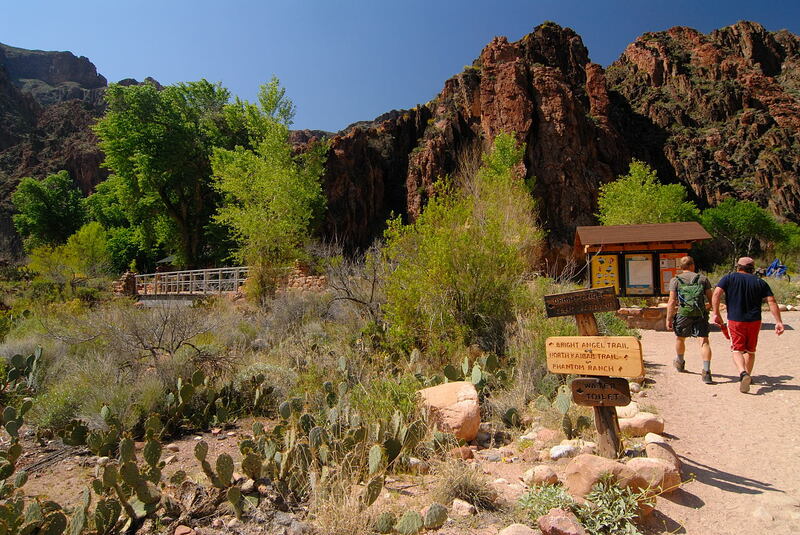 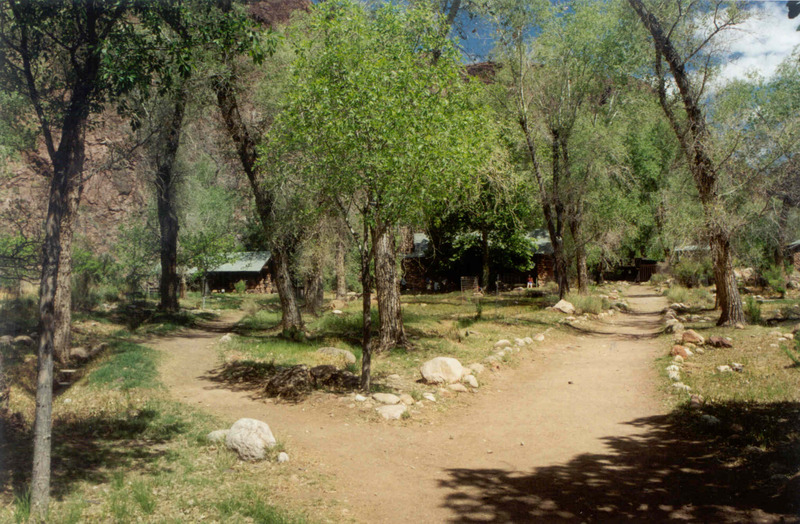 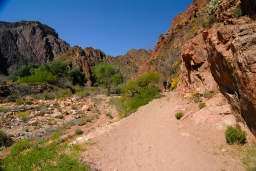 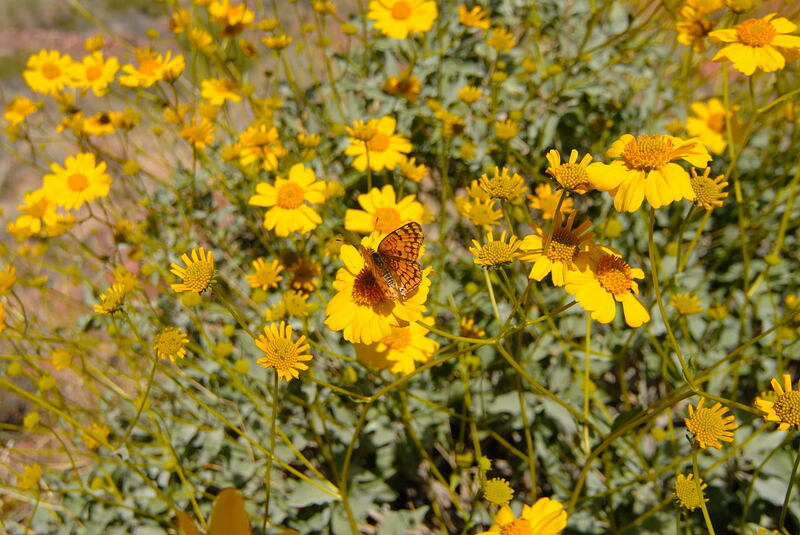 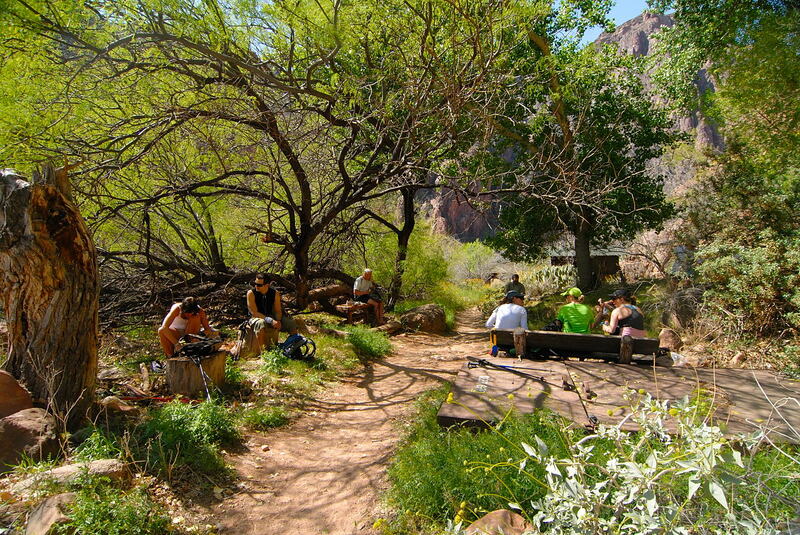 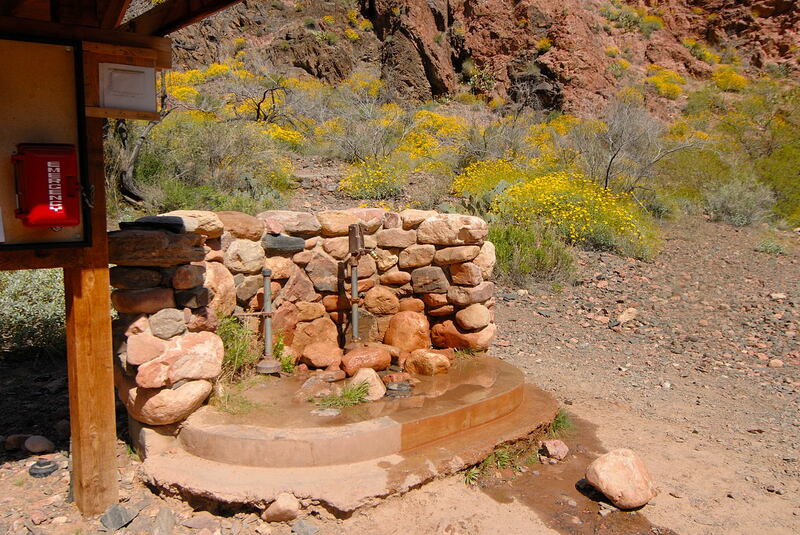 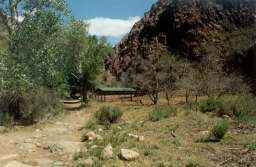 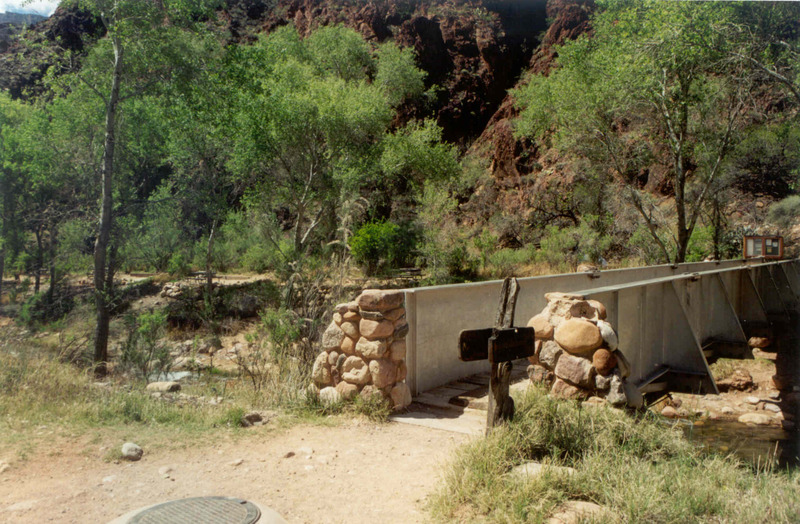 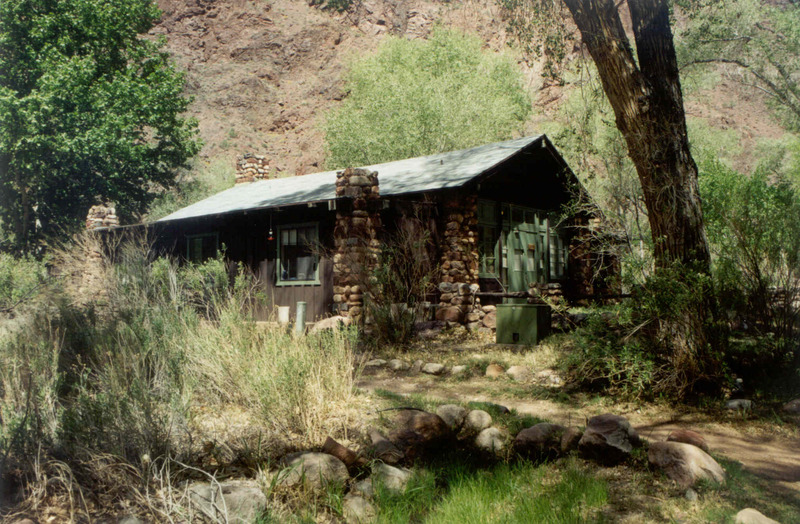 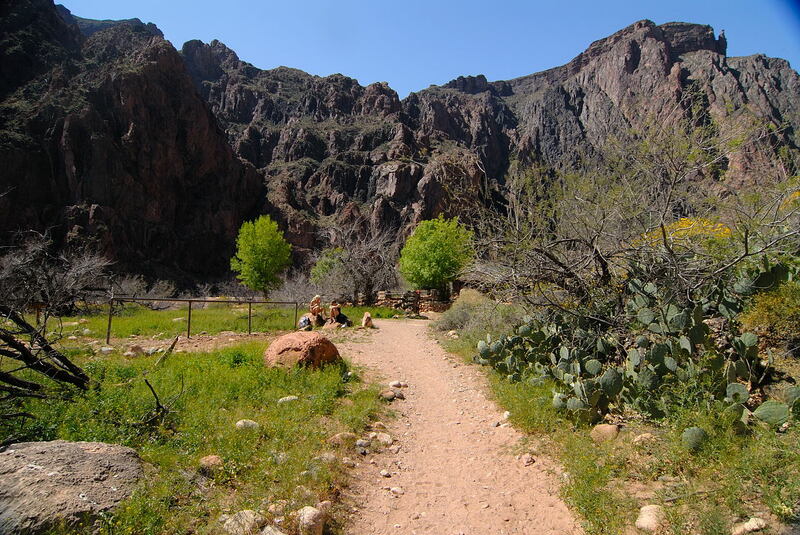 Phantom Ranch is an oasis at the bottom of the canyon; a gorgeous setting against the cottonwood trees and other greenery that the nearby creek make possible. 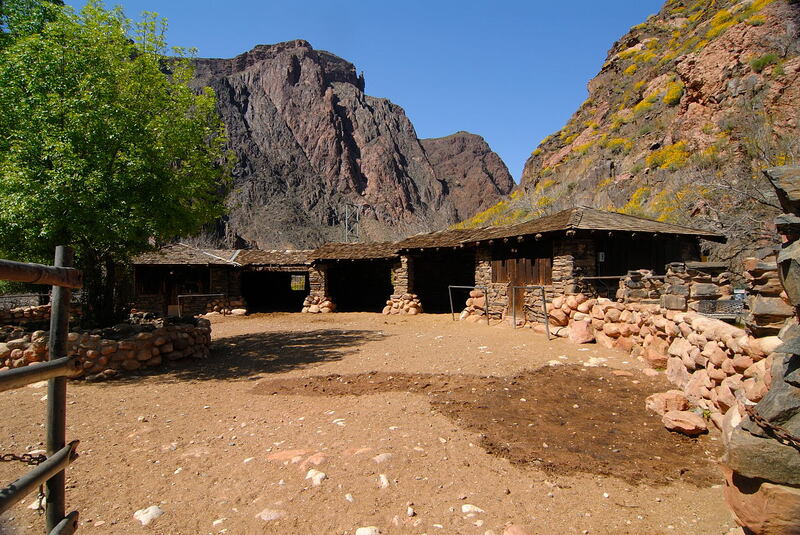 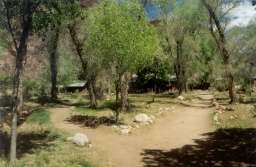 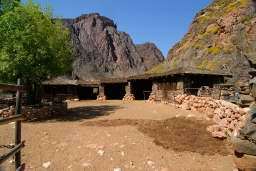 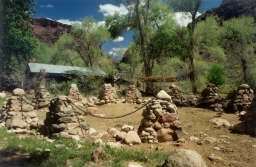 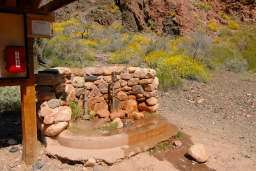 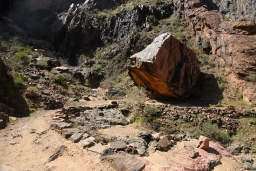 Phantom Ranch is not a five star resort. 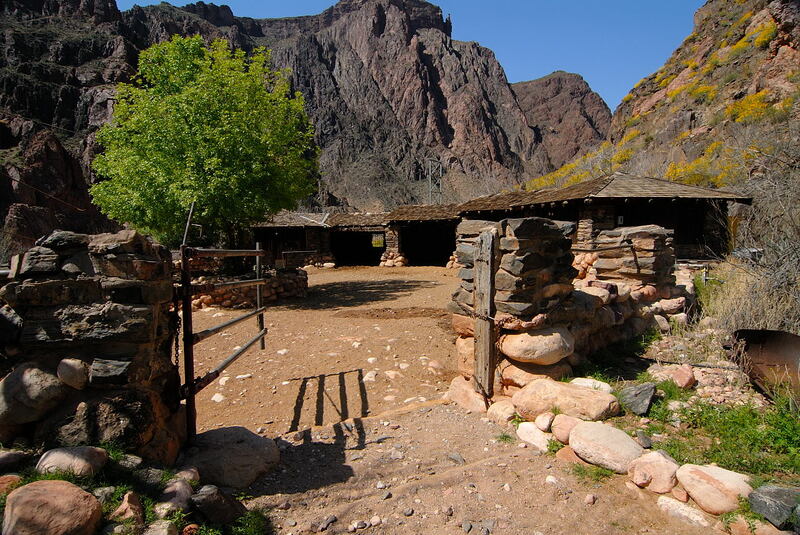 The cabins are small, there are no bellhops, and no valet service unless you're riding in on a mule! 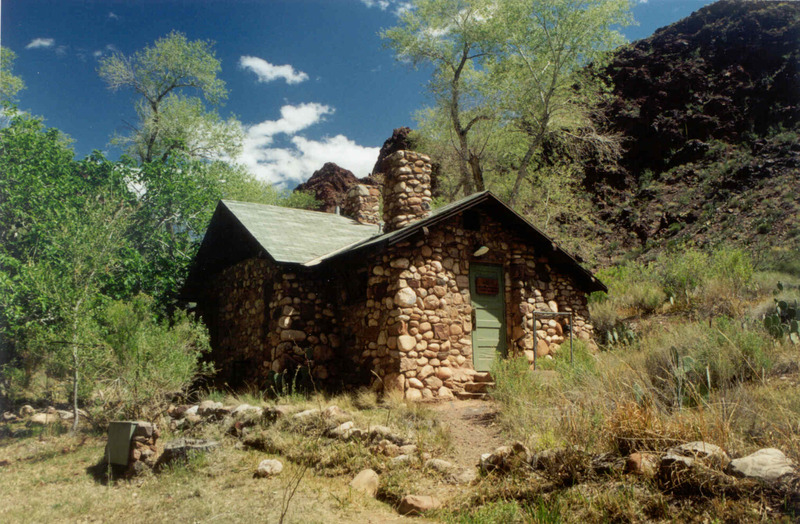 But as in all real estate it has the three most important essentials: location, location, location. 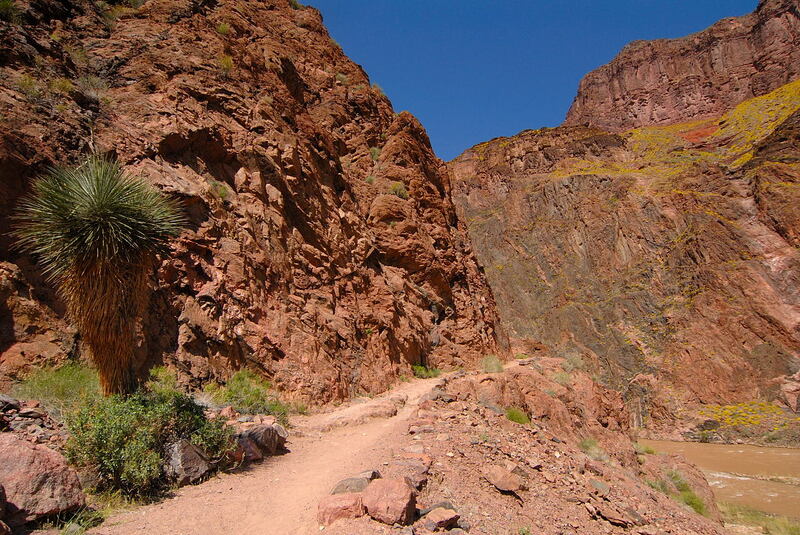 There seemed to be very few people about, but I did not have enough time to really explore and enjoy the area. 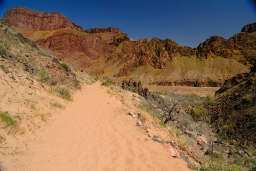 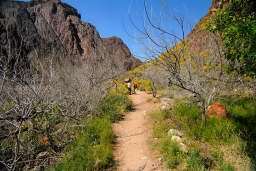 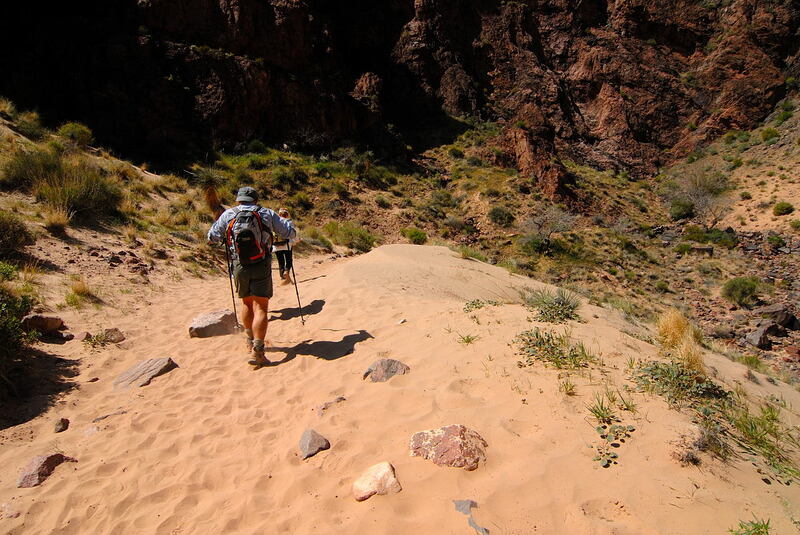 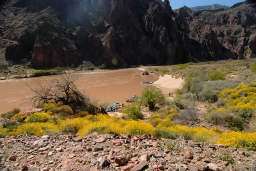 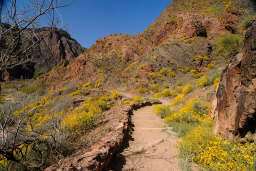 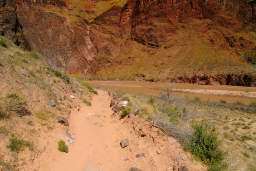 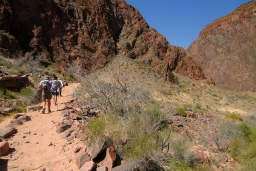 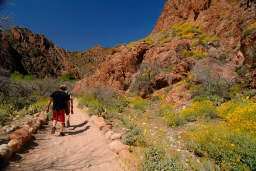 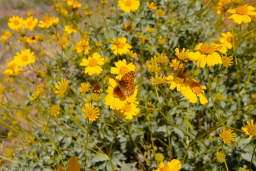 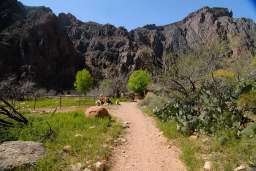 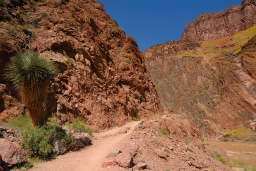 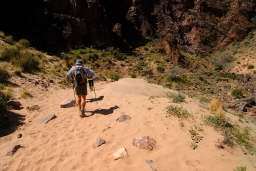 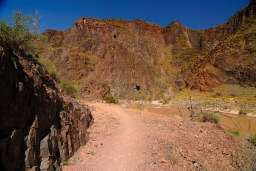 The heat also weighed on my mind as it was anywhere from 95-100 degrees Fahrenheit (35-38 C) so I was anxious to get back on the main trail which would lead me out of the canyon. 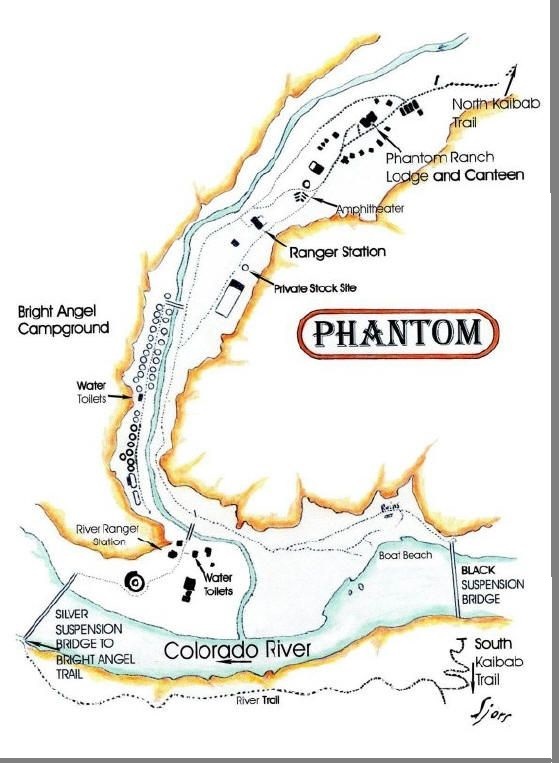 Here is an excellent map of the area from an excellent website: www.hitthetrail.com. 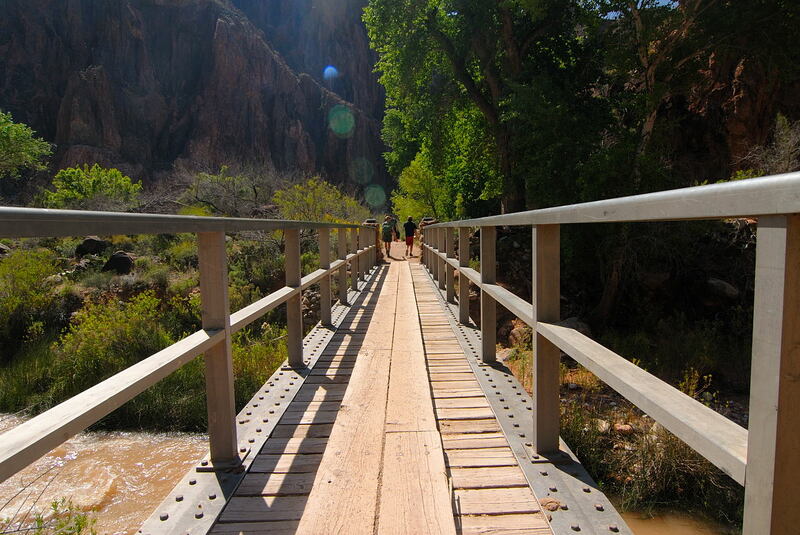 Crossing over the bridge we are back on the trail. But just on the other side of this bridge is a great stopping point as there is water and a flush toilet facility. 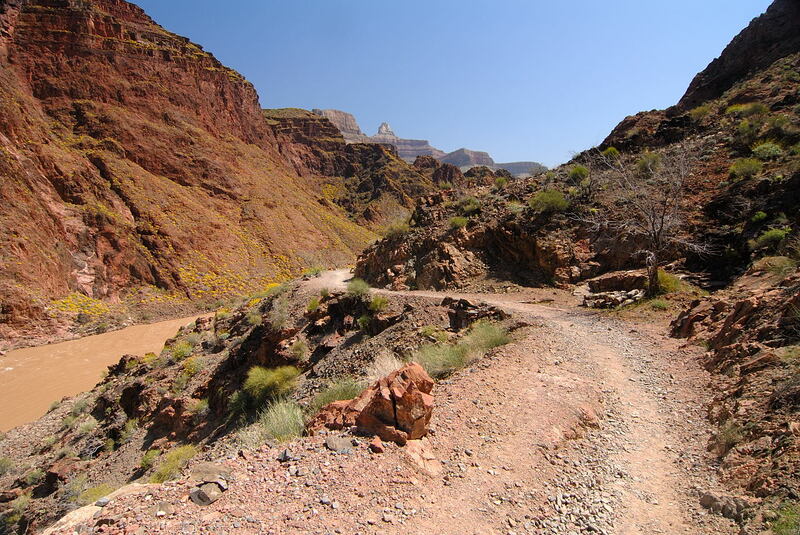 We've now arrived at the bottom of the Bright Angel Trail, so we are ready to ascend. There are 3 more pages to complete the entire tour. To continue on hit next.